With 6 illuminated temperature settings and fast heating action, the Beurer Super Cosy Heated Throw is also a cost effective solution to keeping warm. 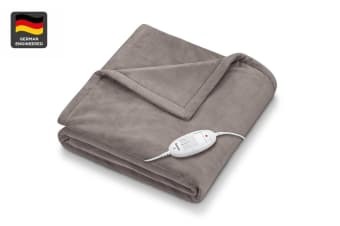 Wrap yourself in a luxurious, cosy, fleecy fibre with the Beurer Super Cosy Heated Throw. The throw has an automatic switch-off after 3 hours, low energy usage (100 watts) and a detachable power cord. It’s also machine washable to ensure a long, comfortable product life. The Heated Throw proudly features the Oeko-Tex 100 global standard, an assurance that no pesticides or chemicals have been used in the production of the materials or the fabric ensuring the Heated Throw is natural and especially skin friendly. Heat relaxes the muscles, promotes circulation and activates blood supply to cells. Not only is heat therapy often used to treat soreness, tension and stiffness, it feels fantastic on your muscles, especially during the colder months.